A minimalistic single sided Arduino compatible development board. I got a request from a college student in Brazil for a minimalistic Arduino PCB, very similar to a project I worked on a while ago. The requirements were to have a low cost single sided board that was easy to manufacture. It uses wide traces and a minimum of components. Instead of having a USB connection, a 5V FTDI cable is used. The board can be powered by either the FTDI cable or an external power supply (like a 5V USB charger or batteries). See it as what comes between a Veroduino and a Diavolino. In order to simplify the layout, the ICSP connector was removed. The bootloader can instead be programmed through the Arduino pin headers, or by removing the IC. An AVR-ISP (in-system programmer), USBtinyISP, a ParallelProgrammer, a Boot-Cloner or an Arduino can be used as a programmer. The Nanino has a serial interface (ttl level) that is compatible with a standard 5V FTDI cable. You can also build your own serial adapter or for example use a Sony Ericsson dock as adapter. Note that the FTDI auto reset is not implemented. You can either press reset after a program update, or add a 0,1uF capacitor between pin6 of the FTDI cable and the reset pin. This entry was posted in CNC Mill, Electronics, PCB by Johan von Konow. Bookmark the permalink. I plan to make it, sell a few kits of it and will be putting the design files (bottom artwork and silkscreen) on my site for download. Sure it is under a Creative Commons Attribution-NonCommercial-ShareAlike 3.0 Unported License. So you can modify it as much as you like! I will need to convert this into Eagle or something first… so I can put in the ICSP connector – I do like your CAD approach though. I never thought of placing components diagonally on a PCB and your design of this arduino is quite interesting. like you, I also never thought of twisting the microcontroller diagonally. I have a clone that I built which comes close to this size, but took weeks in Cadsoft planning the shrink. Great Job, Johan!! If you have a working eagle file with ICSP, please share it. I’m sure other will appreciate it! You should label your components, R1, R2, etc. Also it is not clear what parts are through hole, and what parts are surface mount. *They are all thru hole mounted. *The resistor in the middle is the 10k (reset pull-up). Don’t forget to place the LEDs cathode towards ground. I have added a new version and updated the images. Now you can see the exact position of the components! Great design! Do you have a suggestion how to mill this board om my Modela MDX-15? I don’t have a clue what input I can use for your ” html cam (MDX version)” as I don’t have Rhino3D available. I wopuld very much like to reproduce this board ! It would me great to mill out the board myself. I used your HTML CAM for the Modela last weekend. It worked like a charm. I calculated the coördinates using Excel (including the right offset) I would be nice if the HTML CAD accepted an XY offset for the correct placement. I would prefrer to have a file containing the input for HTML CAD for the modela (output from your Rhino script) to be able to produce the board. That should be everything you need to produce the board. The offset is ~2mm – allowing the 3mm router (1,5mm radius) to release the PCB without cutting any alignment edge. Thanks for posting these files! I will try to mill out the board on my Modela soon. I’ll keep you posted. Can you please advise a drill diameter for engraving the paths (first file?). I prepared the modela files using the Vector Mill files and the JvK CAM MDXv19 tool. I have to find a engraving bit small enough (+/- 0.1 mm) to do the job if I can depend on the Virtual Modela output. When you have time could you please link a pdf that i could print out for a toner transfer. 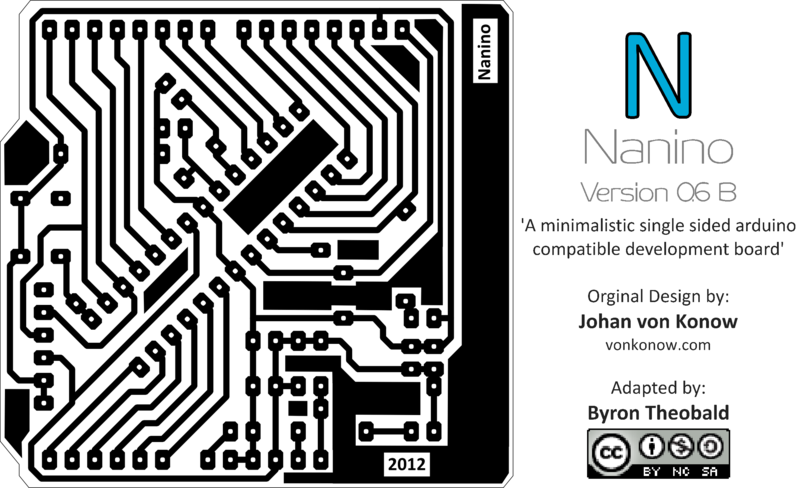 NP, I have added a pdf as an option to the .png. Would it be possible for you to add an image that contains clear labels for parts, I am having a hard time working out which parts have to go where! Also, Which way round does the FTDI go on the header? I managed to get the board etched by my school, I did make some minor modifications to save on board space and added some copper fill. Very ,very good job… I just print the pdf for a toner tranfer pcb. Do you think is possible, in future, to put a kind of prefboard in the space used now for the name and details…. I mean lot of holes to make minimal experiment . As I told I print the pdf, but (shame on me) not mirrored……so folks remember to mirror the pdf before print!! But it’s no bad ….only not very useful,a good test of my mental condition at the moment. Check out the latest version. I have added a prototype area in the unused space. Hope you like it! I just etched the design but I don’t know what part goes where! Can you make a quick picture because your answer from 10/9 still left me baffled. Thank you! Hi John. I have updated the images. Now you can see the exact position of the components! Hi I would also appreciate a little more clarification on component placement if you get time to make a schematic or a picture of a finished board, Thanks..
ie ..the two close together just above the long jumper wire the lower one would be the optional cap is that correct? I have added a new version and updated the images. The latest version has a small prototype area and you can see the exact position of the components (same as before)! Thank you Johan, much appreciated!!! great work my friend..
Just one further question please…should there be a link between the DTR pin and Pin one of the Chip to allow for Auto reset capability? As mentioned in the text – add a 0.1uF cap if you want auto reset (no direct connection). If you are good at soldering a smd cap is easy to add on the backside. I checked the last version ,and yes,it is exactly how I would like to see it! Thank you for the job, I’ve not experience with graphic to do this improvment. And thank’s for the reminder about mirroring, I need. Amazing project, man. I certainly will try to make it. Please, do you have a photo of a real nanino to face it? Thanx for the knowledge sharing. I have added a few pictures of the latest version to the post. your board is really nice. I would like to use it in my project but I need make few changes to your board. Could you provide me with schematic and board files for Eagle if you have some? I will be very gradefull as I will not have to make it from scratch (I´m beginner in Eagle). The board is not designed in Eagle so I don’t have any original file to share. However I did a Eagle vector import, maybe you can use this file? thanks for those files but they can´t be used in Eagle. I will try make your boards from scratch. In the meantime, I decede to make your board from PDF file. I made the board, solder everything as I should but the board is not working. When I try to power it with MCU, nothing happens. When I apply just power (no MCU), power led starts to shine. If I push MCU in a bit (power still on), led on pin 13 start to shine as well, but if I push MCU completely in, board goes dark. What is wrong? I checked board for shorts, but I did not find any :-(. Does the power led also go dark when the MCU is inserted? 1. Is the PCB mirrored? 2. Is the MCU inserted correct (reset switch to pin1)? 3. Is the led’s mounted correct (cathode to gnd)? 4. Measure the voltage before and after the MCU (is it stable 5V)? 5. Have the MCU got the right fuse settings? 6. Have the MCU an Arduino boot loader and a test program (like blink) installed? I really love your design, and I updated it a bit to save space on my copper plates (removing the “playground’), I also enlarge some spacings, my UV machine had some parallax troubles. I give workshops in my area (France), and like to use your card for it. The only problem, is that your license is NC, which avoid me to sell or make money on it. Do you think I can sell boards nanino boards, making a little profit on it (to burn other naninos !) ? I will email you and ask for more details. Can blank PCBs be ordered somewhere? Pingback: Gravure de PCB : Opération réussie ! Hi Johan, first of all thank you for this simple and effective design. It’s just what I was looking for. I downloaded the png version but I had to do some rework: grayscales are evil when you do toner transfer. I prepared an optimized version of your file, with 2-color pcb and 6 layouts on A4 page to optimize transfer paper sheets. If you want I can send you the file. That would be great, I think that other could benefit from your work! Can you please verify which bootlader firmware should be installed in the ATMega328p? Will the Optiboot for ATMega328 be OK? Is the bootloader for the UNO different for thr older FTDI and the newer ATMega8 USB converters? I am expecting a modified version using an extra ATmega8 for USB capabilities. Thank you to share this lovely board. We have LPKF, how can we import the file to fabricate the PCB? or may you provide me the DXF file? can you upload the mirror image of PCB so that I can make it via toner transfer method. I added a .dxf file with the milling paths for both engraving and release tool. Hope you can use it; personally I’m not so found of .dxf since it has so many different versions (I used r12 natural). If LPKF can read G-code, try the http://vonkonow.com/wordpress/2011/11/cam-processing-in-html/ with the neutral file format. Good luck with milling the board! the board near and connected with is a DD signal generator and I put a voltage regolator on the proto part of the board. P.S. I have added files for toner transfer, hope it helps next time ;) D.S. thanks a lot for this new version,really useful one print several prototype….now need time and other micro!!! 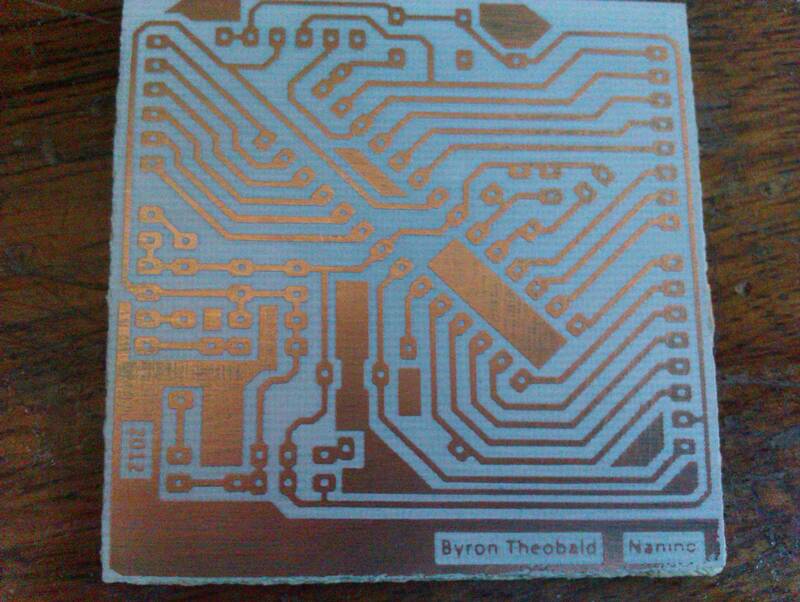 Nice PCB, it looks professional with the silkscreen print. Did you print on plastic or paper? Bravo! Stumbled onto this via Reddit and have to say most useful DIY Arduino I have seen. Thanks for this! Excelente trabajo amigo! gran colaboracion al mundo arduino! De las versiones reducidas es la mejor que eh visto! I have made a few tweeks to your nanino board and would like to share with you. Added isp header and moved a few parts around, also provisioned the crystal for either resonator or crystal. I have the file is photoshop format with parts placement in green color. Message me for the files and I will send to you. can you please add the schematic for this board…. I avoided to route traces between 0.1” pads in order to make it easier to etch and drill (larger traces and pads). But I think your version should be almost as easy to make and with added functionality! Hi Johan, because nanino is my favorite arduino compatible board I use in my telnet server driving 8 relay channel+read the 5 analog (Arduino Telnet Server Basic Arduino I/O a command line interface by Steve Lentz ) plus the classic w5100 ethernet shield. The problem is the nanino have not the icsp connector onboard so we need to connect the 13-12-11 pin with iscp connector on the w5100 board. Some photos here: https://www.wuala.com/enniosasso/Nanino/?key=M2UX7hptQ6da explain better the little job I have done. Hope this help other in the use of this amazing board (nanino). P.S. check out how dexterboot routed the ICSP in the comment above D.S. Hi, i made some modifications in your project! Basically i change some components on the PCB and made it battery powered (AA)! Thanks for sharing! It fits really well with the battery pack. Nice work! I have just started playing with Arduino, and thank you for your help. I would suggest to implement a 0.1uF cap between the DTR header and reset. This makes it possible to use auto-reset. With the board nanino I need a plate with for FT232 or can I only connect the USB cable on it and your computer? Is it possible for you to share you eagle .brd file? I successfully etched my pcb, but I can’t able to mount atmega 328 IC base on board. After drilled the pcb inthe mid point of a gap you have made in the IC base design, but last two pins 14 and 28 can not match with the pins. I’m not sure I understand where you drilled. You are supposed to drill in the hole in the centre of the pad, where a circle of copper is missing. If you do that you will have 14 holes on each side, 28 in total. Solder an IC socket to the board will allow you to easily change the CPU if needed. If I misunderstood your problem, please explain again.